Best fudge is a wonderful recipe that I got from my cute little neighbor. I remember the day that she was teaching me how to make best fudge. I was new to the neighborhood and she was one of the sweetest neighbors. It was around Valentine’s Day and she volunteered to show a few of us how to make best fudge. She was careful when adding the ingredients, and attentive to making her best fudge. She even gave us a few tips and tricks that I will give you in a few minutes. 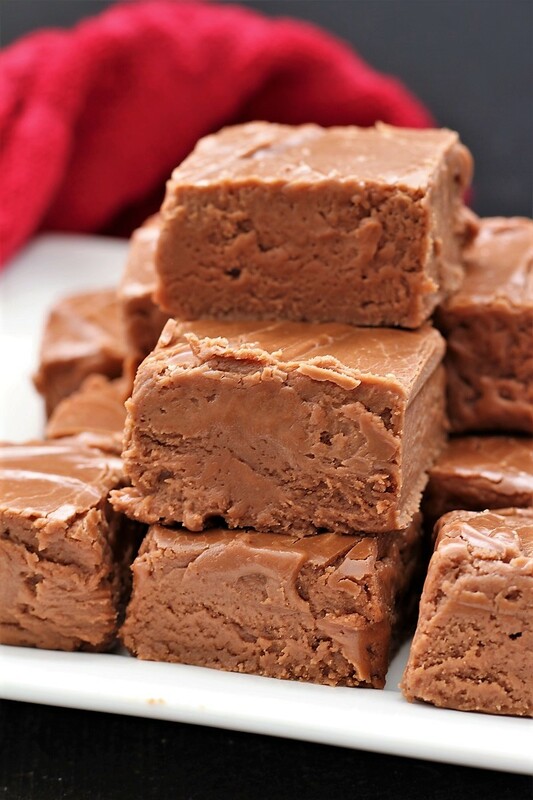 Best fudge is a fun recipe that you can make for that special someone in your life. Valentine’s Day is coming up. I know that some people make cute little boxes out of a cute piece of card stalk and then they put a little fudge that has been wrapped up in plastic wrap in the cute little box. 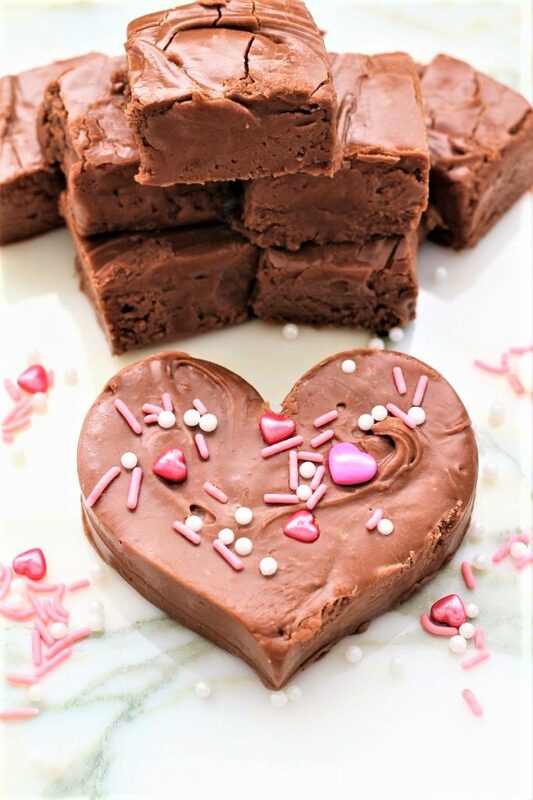 Your sweetheart will love how rich and creamy best fudge is. One other thing that you can do to make it a little funner, is to add some sprinkles to the top or any fun topping that you like, or you can just leave it plain. Some of the fun memories that I have of Valentine’s Day, is that we use to make cute little Valentine’s Boxes to put our valentines in. One year my box even won a prize; I was so excited. I loved my box and I am pretty sure that I kept if for about 2 years. Valentines now days is a little bit different. I know that my grandson, just goes around and puts a Valentine in an envelope and then they just pass out the envelopes, and they do not have anyone’s name on the envelope. They simply sign their name on their Valentine and give it to whomever. I remember reading my valentines when I was young and making sure that I would not give a mushy valentine to a boy that I did not think was just totally awesome. The way that they do it now at my grandson’s school, I am sure does make it a little less competitive. I know one year (and I know that my grandson has a lot of energy) my grandson was very last to pass out his Valentines, they went around to each desk, some of the kids told him that they didn’t want a Valentine from him. Now let me tell you, that is not a very nice way to treat others, even if they are a little hyper and full of energy. Every person has a right to have and give a valentine on Valentine’s Day, and mostly if they are a younger kid! He is special, even if he has his own agenda. He has ticks, and he makes some sounds that bother the other kids. But when you remind him of how annoying the sounds are, they get worse. I am sure that it is a little frustrating for him as well. I guess the next thing that might happen is that we could send out our valentines on the computer, and I am sure that there are plenty of cute ideas that people have come up with, I know that I have gotten some pretty cute Christmas and Birthday cards on the computer. I think that I prefer the old fashioned kind, one that is hand made or a little card telling you how amazing you are. 🙂 I even love a little treat like best fudge. One year one of the kids in the neighborhood sold best fudge and a rose to the guys to give to their Valentines. It was for a fund raiser for his scout camp. It thought it was a great idea and that way, the guys had the opportunity to have something for Valentine’s Day. Pretty great idea don’t you think. I know that a few of the ladies were very excited. Sometimes men just forget and so they were very surprised and excited. Kudos for this young mans mother, because I am pretty sure most of the work was done by her. That is pretty wonderful when a mom will help her son out like that. I wonder what she got for Valentine’s Day? Ha ha. I was trying to think of my favorite Valentine’s Day, and I think it would have been when someone cooked me a meal and then the kids served it to me. Not sure if that happened, but I think that I could really enjoy that. Did you know? Approximately 150 million Valentine’s Day cards are exchanged annually, so this makes Valentine’s Day the second most popular card-sending holiday, after Christmas. I do not know about you, but I still need to send out my Christmas cards. Wow, isn’t that so cool to know. I would have never thought of Valentine’s Day being so big, but it does make sense. Let me know what some of the fun things that you do for Valentine’s Day are? And do you do little things for your kids and neighbors or just your significant other? I do know that there is one thing I know, and it is that this best fudge is truly the best! It is creamy and smooth. I do not put nuts in best fudge because sometimes they give some of my family cankers! Ouch and nobody likes cankers. This is a picture of how it looks after you have cooked the sugar, butter, and the milk. Then after boiling it for 10 minutes you go ahead and add the chocolate and the marshmallows. After that you stir, stir and stir some more. 1- I like to wet a spatula and rub it along the inside of the pan where the mixture boils up, removing any extra sugar so that the mixture doesn’t crystallize. 2- I only had one Hershey bar and so I added 2 bags of chocolate chips. 3- If you like a darker chocolate, add semi sweet chocolate and your fudge will be darker. 4- Cookies and cream would be amazing with crushed Oreo’s and white chocolate! 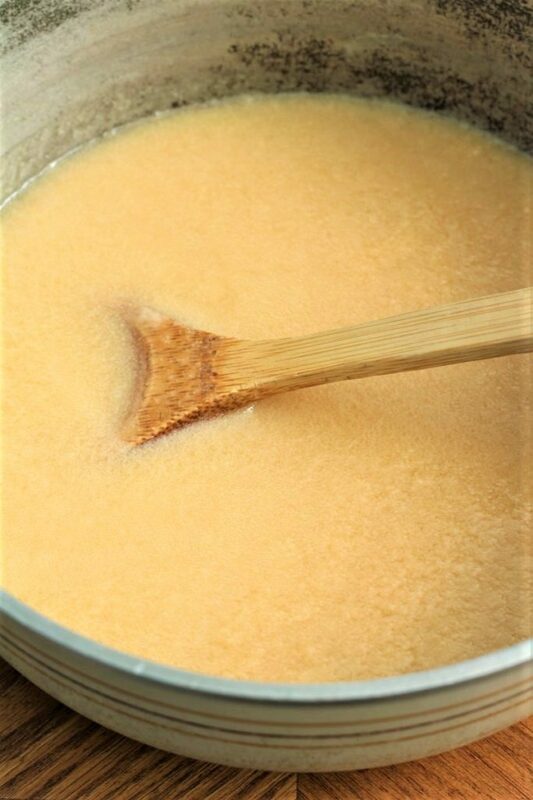 in a large sauce pan, (one that hold at least 10 cups or more) combine the sugar, milk, and butter. Boil on low heat for 10 minutes. 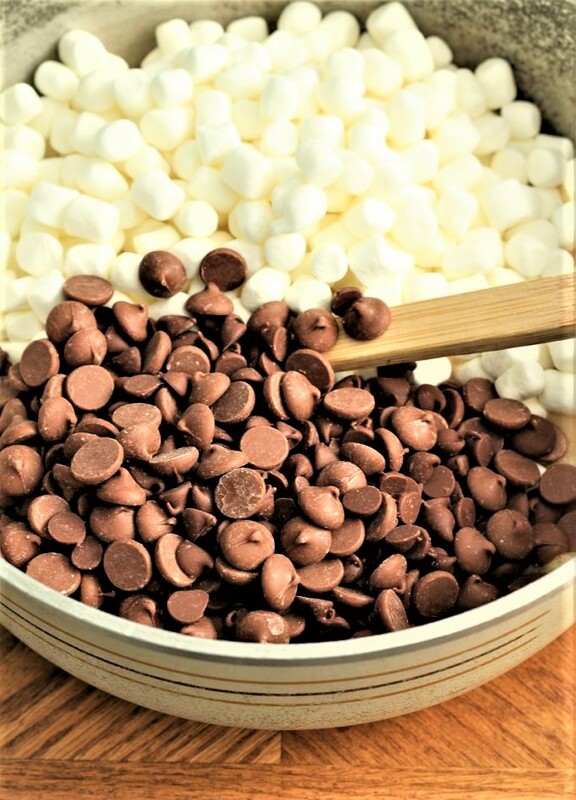 Add the marshmallows, chocolate chips, and the Hershey bars. Mix well, and make sure that everything is combined, then add the nuts at this time if you are adding them. Lightly grease a cookie sheet or a 9" x 13" pan. You can do either depending on if you like your fudge thicker or thinner. Cut into the size of squares that you desire, or make into shapes according to the holiday. Mmmmm I just want to sink my teeth into this fudge!! So thick, chocolatey and creamy looking!! Perfect V-Day gift! Thank you Kelly! It was so good, I had to get it out of the house. Ha ha. I sent it to work with my daughter! O MY!! 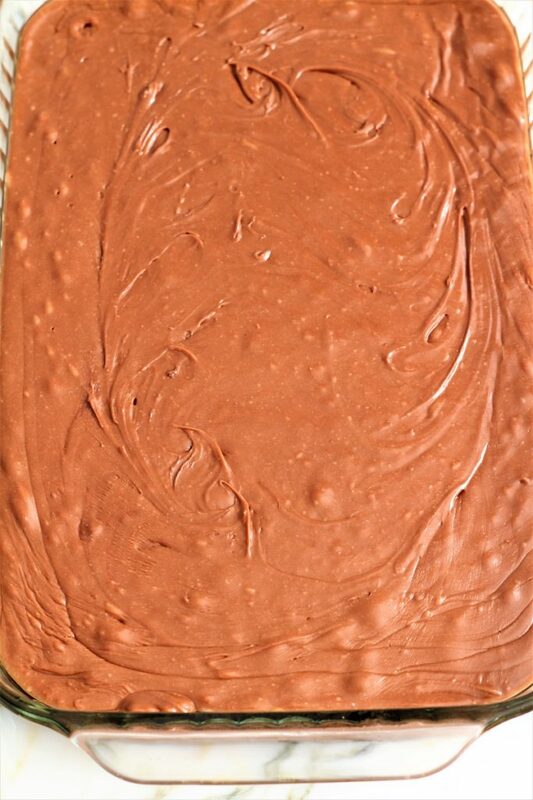 This looks very good and quite similar to the recipe I use Foolproof Fudge. For Christmas I made it with both chocolate chips and peanut butter chips and it turned out pretty good!! Thanks for sharing this recipe!! I will have to try it!! Thanks too for stopping by!! I used milk, if you want it darker, use semi sweet. Good luck! Thank you for the feature of our Best Fudge. It really is good and we appreciate you. See you at the party! Thank you for the feature. This fudge is wonderful!! !